Woody van Eyden’s popular LIVEfromIBIZA show is expanding (2017: 50 stations, 53 countries, 3,7M Listeners in total). 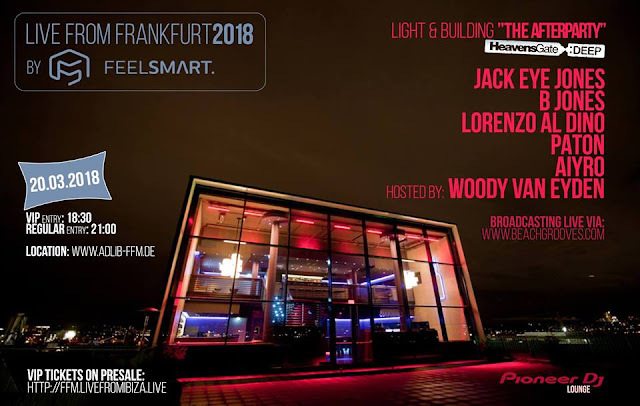 The successful radio and event concept that already aired live from the white isle into the world since many years is coming to Frankfurt (Germany) for the first time. The exception of this event is the combination of an exclusive guest experience, high quality music and a featured live radio broadcast. The "LIVE from" team has perfected this split on the roof top of the DJ hotel Ocean Drive Ibiza over the years and presents it at the Adlib — one of the most outstanding locations in Frankfurt am Main. Musical quality is guaranteed from international top DJs who have previously been part of some of the Ibiza shows and know how to underline an extravagant atmosphere.